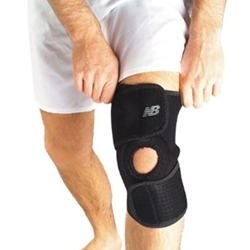 This versatile wrap design stabilizer will keep you comfortable as your injury heals. New Balance Sports Recovery Gear is available in a full complement of styles and designs to meet every need with with the appropriate degree of support. • Our perforated design allows the AOS gear to "breathe" providing crucial air supply and comfortable support. • The terry lining absorbs moisture and increases comfort. • AOS gear is anti-microbial, fighting odor causing bacteria. • The reflective NB logo adds a measure of safety in low light conditions.